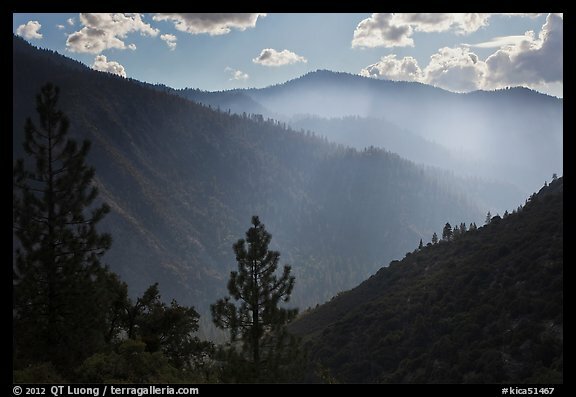 Last year, I spent some time in Cedar Grove, Kings Canyon National Park, trying to find out whether it was another Yosemite Valley. In the previous post, I reported about my explorations of the Cedar Grove valley floor. In this post, I am describing some of my findings on the Cedar Grove rims from a trip later in the year. 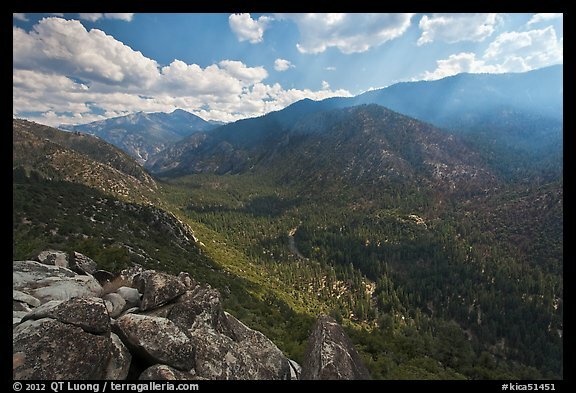 From Cedar Grove, there are just two trails that climb from the valley floor to rim views. 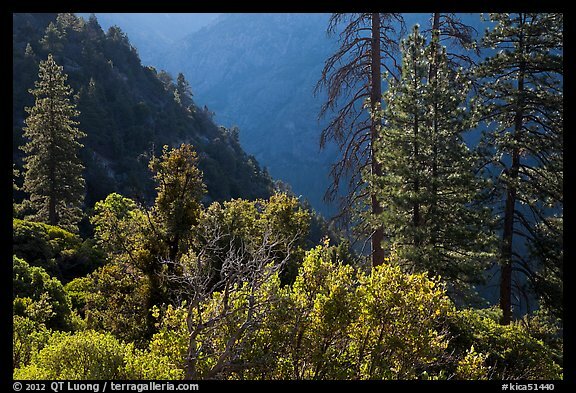 The easiest is the Hotel Creek trail, which is best hiked in early morning, as it climbs, via switchbacks through chaparral, a south-facing side of the valley. After 1200 feet of elevation gain and 2.5 miles, I reached the Cedar Grove Overlook. The light would probably be better in late afternoon – in the morning, the view towards Cedar Grove is backlit – but I was more interesting in exploring the loop in daylight than waiting there and hiking down in the dark. Although this is the closest high vantage point to the valley, I found that from this it perspective lacked impressive features. Using a wide-angle lens, I waited for a cloud to shade the foreground, as I didn’t want the brightness of the light rock to overwhelm the image. The eye is always attracted to the brightest areas in an image, and when such areas happen to be in a corner, they can lead the eye out of the image. I went back to the trail junction, and continued past the turn-off to Cedar Grove Overlook, crossing a lovely forest beyond which the Monarch Divide came to view. After 1.25 miles, the Hotel Creek Trail drops down to join the Lewis Creek Trail. Along the descent towards the Valley, there were some interesting downstream views, but since that was from a side valley, it consisted mostly of ridges. The last 2 miles, from the Lewis Creek Trailhead back to the starting point followed a trail above the roadway. The total hiking distance was about 8 miles. 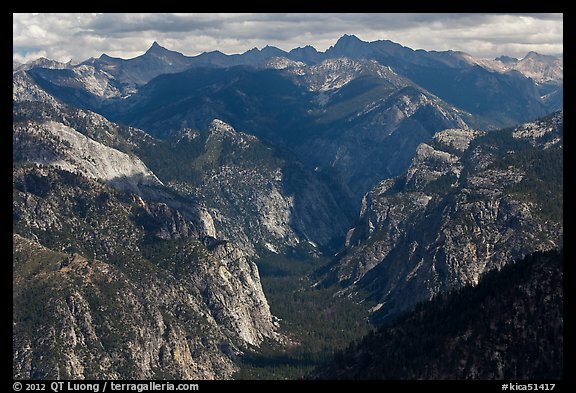 Yosemite has Tunnel View and a number of rim overlooks easily accessible from the Glacier Point Road, including Glacier Point itself with its panoramic, 270 degrees views. Although Cedar Grove does not have such a rim road, there is a relatively accessible panoramic view from Lookout Peak – although a bit distant. Unlike Glacier Point, chances are you’ll have it all to yourself like I did. Because the viewpoint is located almost straight west from the very deep Cedar Grove valley, I didn’t think that the early morning or evening light would be favorable, so I chose to come mid-day. Like at Cedar Grove overlook, I waited for the background to be shaded by a thin cloud. As Lookout Peak is some distance from the valley, I switched to a telephoto lens for a closer view of the glacially carved valley, and lingered on the summit for a long time, observing the play of light and shadows as the clouds moved. At first, it doesn’t look like Lookout Peak is that easy to access, since from Cedar Grove, the roundtrip hike through the Don Cecil trail – the other trail to climb out of the valley – is about 14 miles and climbs 4,000 feet. However, after a bit of research, I found out a little-known shortcut. 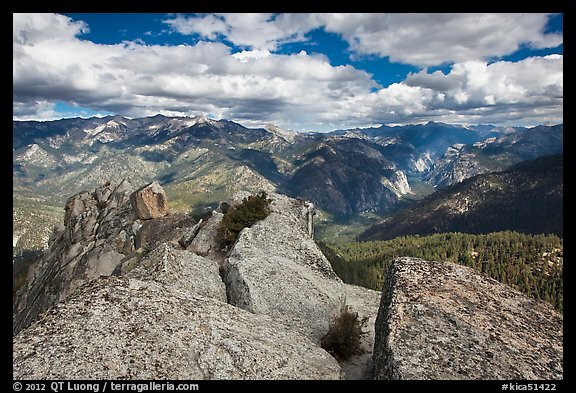 Lookout Peak is on the border of Sequoia National Forest and Kings Canyon National Park. By driving through National Forest roads, I was able to get to park my car within 1/2 mile of the top of the Lookout Peak, from which there was a steep but easy non-maintained trail to the summit, home to prominent radio towers. 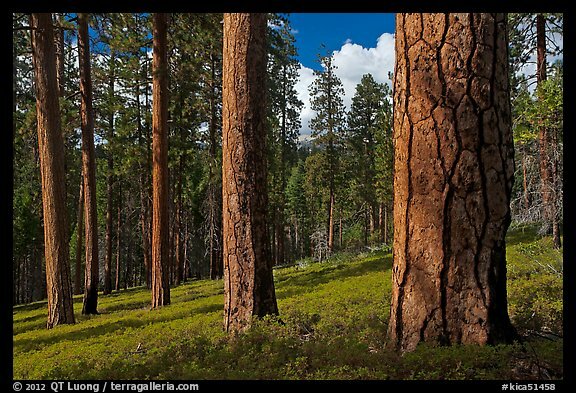 Take the Big Meadows Road (14S11) east of the General’s Highway almost exactly half-way between Grant Grove in Kings Canyon National Park and Lodgepole in Sequoia National Park for about 15 miles, passing a large campground. The road starts paved and turns to dirt, but a regular car can make it with careful driving. When you reach the road end, turn back, and within 1/4 mile, near a prominent turn, you’ll see a large turnout on the east side. Posted on January 19, 2012, 10:01 am, by QT Luong, under New images. Thanks, QT. Really enjoyed these images, and thanks for giving me some new ideas when I head back there next Fall.